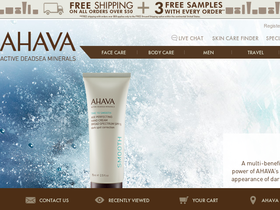 AHAVA, online at ahavaus.com, is the destination for all of your face care needs. AHAVA offers big savings on face care products. AHAVA offers cleansers, toners, exfoliators, masks, daily moisturizers, anti-aging products, serums, and eye creams. Check out RetailSteal.com for the latest AHAVA discounts, AHAVA promo codes, and AHAVA coupon codes. AHAVA offers shipping promos that change often. Stop by RetailSteal.com for the latest AHAVA shipping special offers. AHAVA offers standard and express shipping options. AHAVA ships to the United States and worldwide. Shop at AHAVA and enjoy 40% savings on your order. Click here for code. Shop at AHAVA and enjoy 20% savings on your order. Click here for code. Shop at AHAVA and enjoy free shipping and 3 free samples with orders $50+. Click here to shop. Enjoy a free gift with email sign up at AHAVA. Click here now. Choose 3 AHAVA products to create a Mother's Day gift set and enjoy 25% savings. Click here to shop. Hurry over to AHAVA this spring and use our coupon code online to receive a 30% discount on purchases of $150 or more.